>> Announcing Tennis Summit 2018! After nearly 4 months of hard work, I’m proud to announce that I’ll be hosting the world’s biggest online tennis conference: Tennis Summit 2018! From April 25-30, you’ll be able to watch presentations and interviews from 30+ world-class coaches on your computer and smartphone. And you can get a free ticket to watch all the sessions! The experts on Tennis Summit 2018 will teach you the technique, strategy, fitness, and mental toughness you need to help you become a better player and reach the next level. You’ll get to watch over 30 hours of extremely valuable video presentations, interviews, and recorded lessons during the 6 days of the summit. I truly appreciate the time and effort from all of the coaches and experts to help make this summit a fantastic event! The awesome part about this event is that it is free to attend! Think of how much cash you’d have to invest to get this amount of advice from all of these world-class coaches. Even one tip could make a huge difference in your game, and you’re going to learn about a hundred of them when you attend this event. The coaches on the summit have had so much success helping thousands of players like you improve their games. You also have the option to upgrade to lifetime access to all the videos, which includes downloadable mp3 audio files so you can listen to the sessions from anywhere you want, access to a private facebook group to discuss tennis with other passionate tennis players like you, a question and answer session with me, and other exclusive bonuses. For all the value you are getting, I think the price (hint, it’s under $100!) is pretty reasonable. Whether you just want to watch the videos, or upgrade to the All-Access Pass, it’s a no-brainer to sign-up for your free ticket to the event. If you’re a passionate tennis player who wants to improve your game, you’ve got no excuse not to check out Tennis Summit 2018. 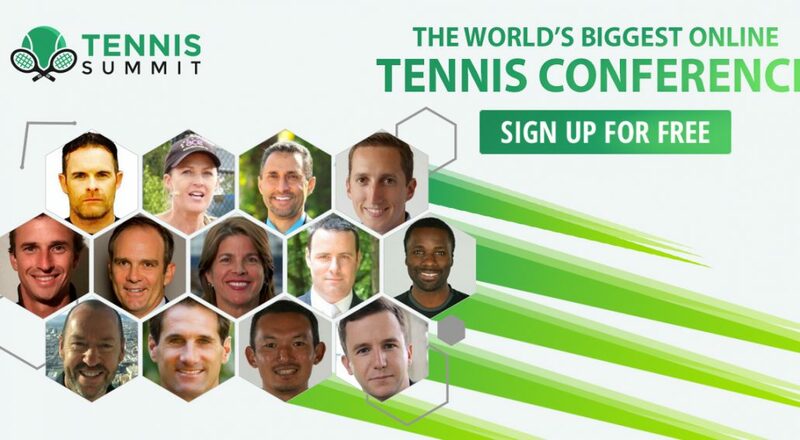 Click here to get your free ticket to Tennis Summit 2018! I’d also really appreciate it if you could share the event with any people or groups that are interested in becoming better tennis players. My goal is to positively impact as many people as possible with the summit. Click Here to Share the Summit on Facebook! Click Here to Tweet the Summit! As always, if you have any questions, feel free to reach out to me at mehrban@tennisfiles.com. Let’s make this event as big as we can!! See you at the summit! Sign-up for Tennis Summit 2018 below! Get Your Free Ticket to Tennis Summit 2018! Join 30+ world-class experts from April 25-30. Register Now! TFP 080: Q&A 4.5+ Edition — Re-tooling Your Strokes, Backhand Tips, Serve Consistency, Returning, Advanced Drills and More! Subscribe to The Tennis Files Podcast! Do You Want to Improve Your Tennis Game?